Each year, to highlight the many fascinating archives and heritage sites in our area, the archivists of Portland gather at three area locations and invite the public to visit each spot and learn about our region’s rich collections. More than 25 local institutions are participating in the 2014 Oregon Archives Crawl, including PSU Library Special Collections and University Archives. You’ll find our table with several others at the City of Portland Archives and Records Center, right here on on the PSU campus, on the 5th floor of the PSU Academic and Student Recreation Center (ASRC). 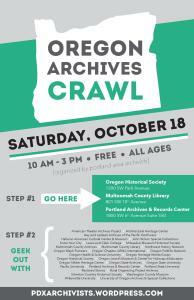 The other locations for the 2014 Oregon Archives Crawl are Multnomah County Central Library and the Oregon Historical Society, each of which is hosting ten additional archives. This fun and free event takes place on Saturday, October 18, from 10am to 3pm, which gives you enough time to visit each host organization. PSU Library Special Collections and University Archives is participating in this event as part of Portland State of Mind.